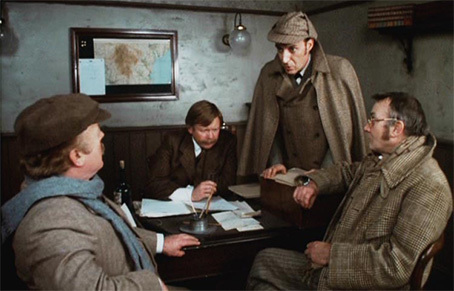 We're big Sherlock Holmes fans here, not just of Arthur Conan Doyle's original stories, but also a good many the film and TV adaptations of them. 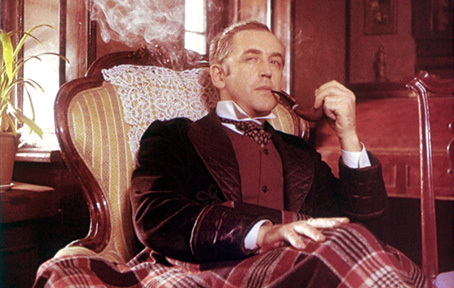 There's no question that The Hound of the Baskervilles is the most famous Holmes story of all, and as far as I'm aware it's also the one that has spawned the most film and TV adaptations. The extra features on the recent Arrow Blu-ray of the 1959 Hammer adaptation – whose release this week is the reason for the timing of this list – suggest there have been about thirty to date, and given the international fame of London's finest consulting detective, there may well be even more. Below is a pick of five personal favourites, a pick that is inevitably restricted in scope by the simple fact that I've only seen just over a third of those whose titles I've been able to track down. Given that a fair few were made in the silent era and are not freely available, I can perhaps be forgiven a little laxness here. I should emphasise that I'm talking specifically about adaptations of The Hound of the Baskervilles here and not Holmes films in general. That, perhaps, is a subject for a later list and not wholly unrelated list – I have a feeling there might be some crossover here. And so to the films, which to avoid any suggestion of preference I'm going to list in release order. 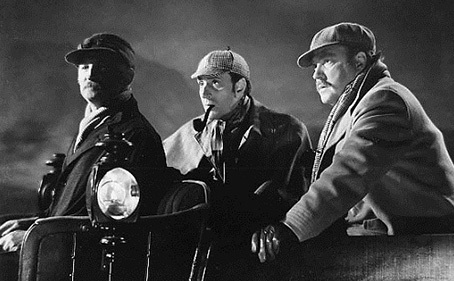 Starring Basil Rathbone as Holmes, Nigel Bruce as Watson and Richard Greene as Henry Baskerville. Basil Rathbone's fearsome intensity and commitment as Holmes cast a long shadow over subsequent interpretations of the role, and for my money Nigel Bruce is at his best as Watson here, a slightly more serious interpretation than the loveable buffoon he would subsequently shape the character into. This was actually Rathbone and Bruce's first feature film outing as Holmes and Watson, something signalled up front by the top-of-the-bill credit given to Richard Greene, though the film's considerable commercial success quickly saw Rathbone and Bruce bumped up to star billing. It's a hugely enjoyable introduction to a pairing whose popularity gave birth to another thirteen films and a radio series. It's worth noting that this was also the first Holmes film to be set in the Victorian era, all previous cinematic outings having been set in the time in which they were made. 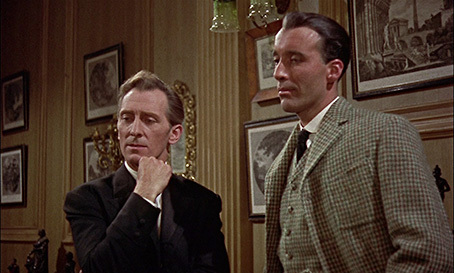 Starring Peter Cushing as Holmes, André Morell as Watson and Christopher Lee as Henry Baskerville. Oh come on, you knew this one was going to be here didn't you? You don't write a review praising a film as the most exciting adaptation of the novel, then are inspired by its Blu-ray release to list your five favourite film versions of The Hound of the Baskervilles only to miss this one off. Of course, it helps that the film is so fresh in my mind (I've watched it three times in the past week) and that it looks so great on disc, but it's also a belting example of Hammer at close to the top of their game. Peter Bryan's smart script takes some liberties with Conan Doyle's original and the hound itself is a bit of a let-down (particularly given its fearsome presence on the poster), but Peter Cushing makes for a damned fine Holmes, André Morell lays the previous image of a comical Watson to rest, and Christopher Lee brings gravitas to the role of Sir Henry Baskerville. Terrific stuff. You can read out Blu-ray review here. A Russian Sherlock Holmes? You'd better believe it. For a Soviet audience Vasiliy Livanov and Vitali Solomin were the absolute embodiment of the great detective and his loyal companion, and their success in these roles saw a statue of the pair erected close to the British Embassy in Moscow and Livanov awarded an OBE for his work in popularising this beloved piece of British culture in lands afar. Livanov certainly makes for an arresting Holmes, but it's Solomin's impressively low-key performance as Watson that impresses the most. Of all of the film adaptations of the novel, this remains to this day one of the most faithful, and is one of the few that boast a genuinely spine-chilling climactic hound. You can read our review of the Mr. Bongo DVD release here. The ever-delightful Ian Richardson makes for an unusually upbeat and intermittently cheerful Holmes in this handsomely produced TV movie adaptation directed by Douglas Hickox (he of Theatre of Blood) and adapted from the novel by Charles Edward Pogue, who later co-wrote the screenplay for Davis Cronenberg's The Fly. Impressively shot by cinematographer Ronnie Taylor (whose big screen credits include Gandhi and Cry Freedom for Richard Attenborough), it boasts a choice supporting cast that includes Martin Shaw as Henry Baskerville, Denholm Elliot as Dr. Mortimer, Edward Judd as butler Barrymore, Eleanor Bron as his wife Beryl, Nicholas Clay as Jack Stapleton, Glynis Barber as Beryl Stapleton and the lovely Ronald Lacey as Inspector Lestrade. Connie Booth and Brian Blessed are in there too. My only gripe is that Donald Churchill's performance as Watson is a little too close to the buffoonery of the interpretation made famous by Nigel Bruce. Richardson repeated his role as Holmes the very same year in The Sign of Four, which was also scripted by Charles Edward Pogue, but this time featured David Healy as Dr. Watson. Time to let my personal prejudices show. For me, Jeremy Brett was the perfect screen Holmes, an actor who captured the very essence of the character as written and embodied him so completely that it's virtually impossible to separate the actor from the character. 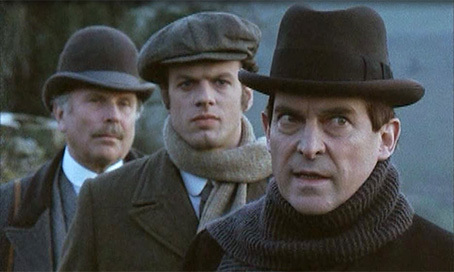 As one of the later Holmes films starring Brett Edward Hardwicke, it doesn't quite reach the heights of the show's superlative first two seasons. But this is still a gripping and atmospheric adaptation. In spite of his sometimes visible health issues, Brett is as arresting as ever as Holmes and Hardwicke is as splendid as ever as Watson (a role he inherited from David Burke, who was frankly even better) in a story that allows the good doctor to take centre stage for a sizeable stretch of the story. Another solid supporting cast includes Neil Duncan as Dr. Mortimer, Ronald Pickup and Barrymore and James Faulkner as Stapleton.